The Heliopan 49mm KB1.5 (82A) Color Conversion Glass Filter is a light balancing filter used to increase the color temperature slightly for a cooler tone. This blue filter absorbs the excessive yellow-red light from daylight in the morning. There is much flattering light to be found in the early morning and afternoon hours. With sunlight low on the horizon, the red-orange end of the spectrum becomes enhanced. With daylight balanced film, images shot in this light may prove to be a bit on the warm side. The photographer may desire this effect or choose to "cool" things down. An 82A has a greater "cooling" effect than an 82 but less than an 82B. 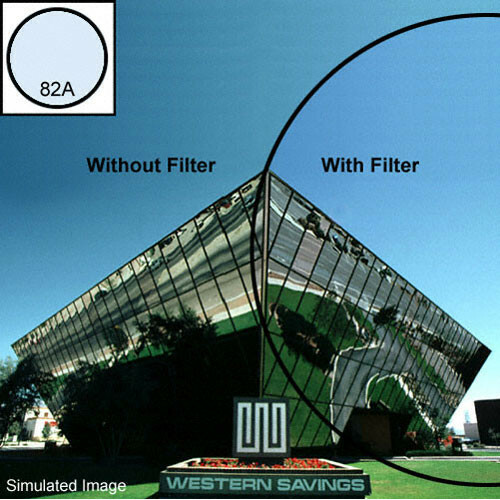 The 82 series of blue filters allows the photographer to keep skin tones somewhat normal by increasing the color temperature to a more daylight balanced level. In addition, an 82A provides a cooler effect with tungsten film less than 3200K lamps. Heliopan Lichtfilter-Technik of Munich, Germany, has changed their black anodized brass filter rings on most Heliopan non-rotating filters to their "slim" mounts. These slim mounts are made of black anodized brass stock and have so little rim in front of the lens (5.4mm) that they will not vignette with lenses as short as 21mm. Heliopan offers a wide selection of sizes, screw-in, series, bayonet, square and rectangular filters including digital, video, center weighted, graduated, wide angle, Kaesmann polarizers, drop-in polarizers, etc. Note: Whereas the 81 Series of filters creates a feeling of warmth, the 82 Series creates a feeling of coolness. Heliopan cuts, grinds, polishes and coats their filters with the same techniques and equipment as used for the finest German camera lenses. All Heliopan screw-in type and series size filters are mounted in precision black anodized brass rings to eliminate binding or cross threading and to ensure optimal alignment. Filters still retain front threads for a lens cap, a lens hood or even stacking a second filter. The portion of the Heliopan slim filters that are in front of the lens have been reduced in thickness by 37% over the former mount.